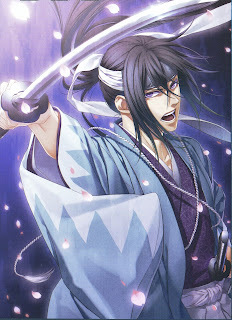 Shiro Samurai's Cosplay: Will Hijikata be crossdressing? + Kemi's manga day up next! Will Hijikata be crossdressing? + Kemi's manga day up next! So before Tracon I had been looking for a purple kimono for Hijikata because I want to upgrade that cosplay for the next time I wear it. Mostly I want to have an actually purple kimono and while there isn't anything wrong with the wig I have now, when it comes to quality and stuff, it just isn't that flattering for my face, so I decided to order a new one. But about the kimono. I wanted an authentic one so I can use it for my kimono hobby too. I was checking eBay and then I found a purple kimono that made me go.. 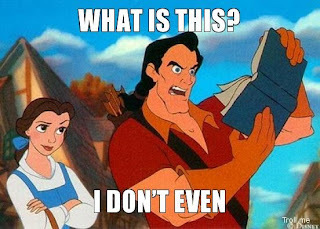 So.. well. First time I saw its thumbnail I was all "it's a woman's kimono" because of the (bright) color.. purple kimono for men barely exist and when they do they are dark/subdued/almost-don't-look-purple. But for some reason I clicked on it anyway because it was cheap (read: 9 dollars) and I was half-way desperate. 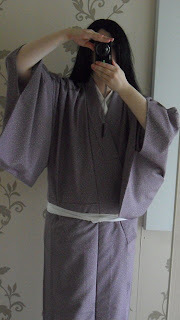 Heck, I had thought that if it was a hitoe (non-lined) woman's kimono I could just learn how to convert it into a man's.. namely fix the sleeves. Soon after noticing the short length I noticed the sleeves... they seemed to be like on a man's kimono, aka almost completely sewn to the body of the kimono... but I couldn't say for sure because the seller's photos weren't that clear and the color threw me off all the time. 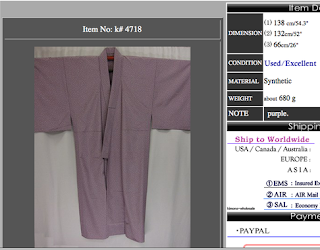 Now the fact that this thing was listed at the seller's store as a woman's kimono made me veeeeeery confused. God knows how many minutes I spent staring on this thing trying to figure out if it was a damn short woman's or a man's kimono which had been misplaced... or a woman's kimono which had been converted into a man's for an unknown reason. Oooh the brain damage done to me by trying to figure it out. OTL I even asked another kimono hobbyist about their opinion before I decided to take the chance to buy it.. heck, after all it was cheap and if it turned out to be a woman's I would just have to modify the sleeves. And don't worry, I haven't forgotten about the Tracon summary! I will write it as soon as I have some photos of my costumes and stop being lazy lolololo.